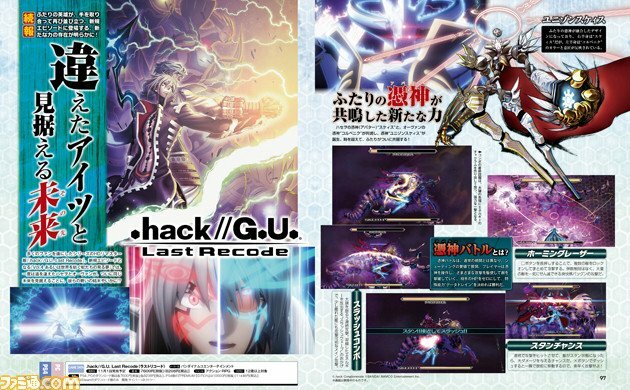 The latest Famitsu magazine reveals a Unison of Skeith and Corbenik for new Avatar Battles in .hack//G.U. Vol.4. Come on Haseo tell Ovan that you like him this is driving me crazy. I don't mind Ovan joining the party it just I don't like him and I'll use him but I'm not romancing Ovan sorry Haseo you're going to have someone else beside Ovan in my play through. So who ready for .Hack//G.U. last recode I am I hope we get other characters to be added to this game also I still want BlackRose, Kite and Tokio. And what else we are getting in Vol.4 we don't know yet info is slowly coming out. Haseo new avatar reminds me something from Digimon maybe it the design it looks off if you ask me I do like vol.3 avatar better but it's a new avatar and new powers. someone also quoted "DNA Digivolution"....eh it so Digimon. Haseo new outfit something off...SAO a.k.a. Sword Art Online, the black holes something from Bleach Arrancar Haseo?, the white that the last remaining of Haseo X outfit and the whole coat reminds me of something Kite would have from .Hack//Link... maybe it's a .Hack//Link hint? Tokio. Wait wasn't Tokio outfit mostly black and white?...And this new Haseo outfit is...oh boy. Overall I do like Haseo X outfit better that my thoughts anyone can think otherwise about this.